Found this photo while nettering around the blogosphere, these babies are so cute! Aren’t they? 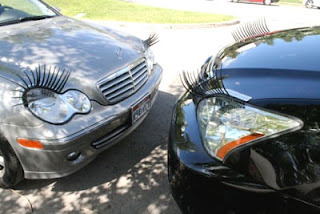 Car fashion indeed has taken another leap, not just polishing and waxing and skirting, but you can now put on some carlashes, I wonder where can I buy this accessory around here… I so love it… promise! It made me even wonder more, what is the gender of cars? LOL. i love it! Pwede nto ni ibutang sa atong eyes? hehehe I wonder,, unsa kaha ang hitsura noh! nahhhh, it take away the real beauty of the car lol. nyahhaha....infairness dko ganahan...samot na siguro si hubby kung makakita ani...eehhehe....joker man kau tan-awon...lol! 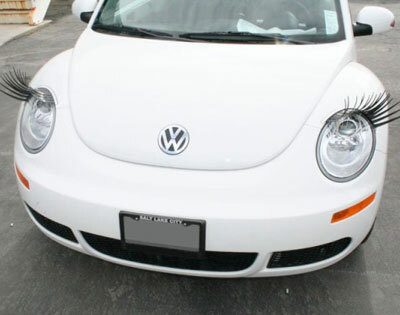 hahaha, sayang ang beauty nang car. I don't like it if they look like toys. A car is a car. A toy is a toy. That's different.